Will ViaSat’s Air Force One contract get trumped? Back in June 2016 there was considerably excitement around ViaSat’s sole source $73M contract to provide connectivity for Air Force One and other senior leadership aircraft. The plan was to replace Boeing’s Ku-band BBSN (which has continued to operate ever since the commercial Connnexion-by-Boeing project was cancelled in 2006) with a dual Ka/Ku-band solution which could utilize the ViaSat Ka-band satellites within their coverage footprint and then switch back to Ku-band in other parts of the world. I’m told that one reason this upgrade happened was that President Obama’s daughters complained that the connectivity on Air Force One compared unfavorably to the speeds available on other ViaSat-equipped aircraft they had flown on, and ViaSat ultimately received a sole source contract, with the US government purchasing a couple of dozen of ViaSat’s dual Ku/Ka antennas in addition to the airtime contract. But I’ve heard rumors that the RF performance of this Ku/Ka antenna failed the WGS compatibility tests required by the Air Force, and so to date the US government has not installed these new terminals, and Air Force One is apparently still operating with the old Boeing system. Its unclear what the end result will be, or if this is an easily solvable problem, but ViaSat’s competitors (especially Inmarsat, which has successfully leased GX capacity to the DoD for manned surveillance missions in the Middle East) are now rubbing their hands with glee. The broader prospects for ViaSat’s Ku/Ka antenna also appear uncertain, with the only commercial customer to date being Virgin America, which is using a handful of terminals on its Hawaii routes. Virgin America’s new owner, Alaska Airlines, has announced its intention to replace its existing Gogo ATG solution with a high speed satellite solution, but some now think that Gogo’s recent lease of the AMC-4 satellite for Pacific coverage means it will win this business with 2Ku. Its interesting to note that Gilat has also developed a Ku/Ka antenna, which Hughes will offer for roaming outside its own Ka-band coverage footprint. Will this antenna be better than ViaSat’s solution, and more broadly will a combined Ku and Ka antenna (which inevitably has a smaller aperture and more beam skew problems) be a realistic alternative to high performance flat panels like Gogo’s 2Ku? The answer to that question will dictate whether ViaSat and Hughes can provide competition in the long haul passenger aircraft market over the next few years, or whether Panasonic, Gogo and Inmarsat will continue to dominate that segment until all three ViaSat-3 satellites are launched in the early 2020s, by which time most airlines will already have made their choice of provider. There’s been a lot of recent news about Chinese investments in satellite companies, including the planned takeover of Spacecom, which is now being renegotiated (and probably abandoned) after the loss of Amos-6 in September’s Falcon 9 failure, and the Global Eagle joint venture for inflight connectivity. There were also rumors that Avanti could be sold to a Chinese group, which again came to nothing, with Avanti’s existing bondholders ending up having to fund the company instead in December 2016. The latest of these vanishing offers was a purported $200M bid from a Chinese company, China Trends, for Thuraya in mid-January 2017, which Thuraya promptly dismissed, saying it had never had discussions of any kind with China Trends. Back in July Inmarsat was also reported to have approached Avanti, but then Inmarsat declared it had “no intention to make an offer for Avanti.” I had guessed that Inmarsat appeared to have done some sort of deal with Avanti, when the Artemis L/S/Ka-band satellite was relocated to 123E, into a slot previously used by Inmarsat for the ACeS Garuda-1 L-band satellite (as Avanti’s presentation at an event in October 2016 confirmed). However, I’m now told that the Indonesian government reclaimed the rights to this slot after Garuda-1 was de-orbited, and is attempting to use the Artemis satellite to improve its own claim to this vacant slot before these rights expire. I also understand that with Artemis almost out of fuel, various parties were very concerned that the relocation would not even work and the Artemis satellite could have been left to drift along the geostationary arc, an outcome which thankfully has been avoided. The action by the Indonesian government seems to hint at a continued desire to control its own MSS satellite, which could come in the shape of the long rumored purchase of SkyTerra-2 L-band satellite for Indonesian government use, similar to the MEXSAT program in Mexico. If that is the case, then presumably the Indonesians would also need to procure a ground segment, similar to the recent $69M contract secured by EchoStar in Asia (although that deal is for S-band not L-band). Meanwhile Inmarsat still appears to be hoping to secure a deal to lease the entire payload of the 4th GX satellite to the Chinese government, which was originally expected back in October 2015, when the Chinese president visited Inmarsat’s offices. That contract has still not been signed, apparently because the Chinese side tried to negotiate Inmarsat’s price down after the visit. Although Inmarsat now seems to be hinting to investors that the I5F4 satellite will be launched into the Atlantic Ocean Region for incremental aeronautical capacity, last fall Inmarsat was apparently still very confident that a deal could be completed in the first half of 2017 once the I5F4 satellite was launched. So it remains to be seen whether Inmarsat will be any more successful than other satellite operators in securing a large deal with China or whether, just like many others, Inmarsat’s deal will vanish into thin air. China has already launched its own Tiantong-1 S-band satellite in August 2016, as part of the same One Belt One Road effort that Inmarsat was hoping to participate in with its GX satellite, and Tiantong-1 has a smartphone which “will retail from around 10,000 yuan ($1,480), with communication fees starting from around 1 yuan a minute — a tenth of the price charged by Inmarsat.” Thus Inmarsat potentially faces growing pressure on its L-band revenues in China, and must hope that it can secure some offsetting growth in Ka-band. In reality, the last six months have seen the first signs of stabilization in satellite capacity pricing, as SES and Intelsat pull back somewhat from their price war which was the proximate cause of the dramatic price declines seen from late 2014 through early 2016. In particular, SES predicted a “strong growth outlook” at its June investor day and presented a slide at the GCA Summit earlier that month showing three Ka-band HTS GEO satellites for global coverage. One of the ways SES was expected to deliver on this strategy was by “focusing on value-added, end-to-end solutions” in each of its verticals. 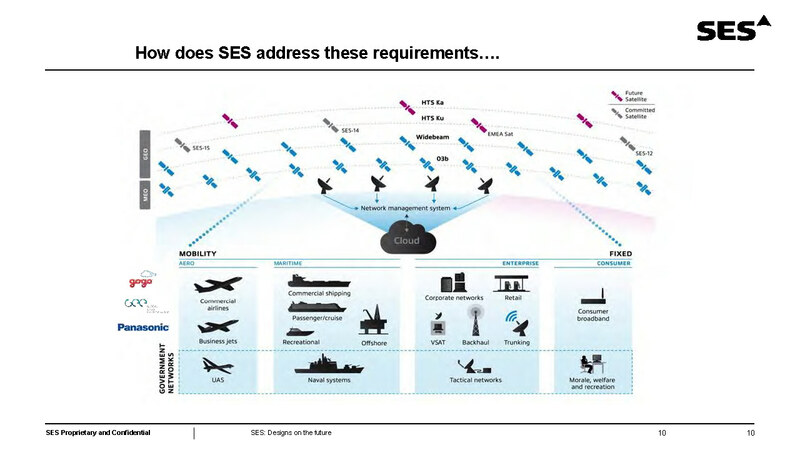 However, since then, SES appears to have dramatically reduced its exposure to Ka-band GEO capacity, putting virtually all the risk of the single SES-17 Ka-band satellite onto Thales, and may also have pulled back on its plans to provide “end-to-end solutions” for mobility, letting Speedcast win the bidding for Harris Caprock and indicating that it will not go direct to airlines in the inflight connectivity market. Intelsat has also won a couple of key contracts for Epic, with TIM Brazil and Global Eagle. Its therefore interesting to see the contrast between Gogo’s assertion at its investor day on September 29 that there will be an “ample and diverse supply” of Ku-band capacity (totaling nearly 1Tbps globally by 2019) with Inmarsat’s position a week later that “Ku-band supply could be limited,” especially in North America. At this point in time, it looks like the “unexpected softness” of satellite orders in 2016, caused by fears about a price crash will mean very few new C- or Ku-band GEO satellites being ordered in the near future without an anchor tenant. Panasonic may well follow Thales’ lead with its XTS satellites, but that won’t result in any (let alone “ample”) incremental supply for Gogo. And Gogo is not in a position to order a dedicated Ku-band satellite of its own to provide more capacity on top of its existing commitments. Operators may well be justified in fearing dramatic erosion in pricing from new Ka-band satellites with hundreds of Gbps of capacity, but outside North America, there simply won’t be any of that capacity available before 2020. As a result, stabilization of pricing (albeit at considerably lower levels than those in historic contracts, many of which still need to be rolled over) seems plausible for 2017-18. Instead I’m much more worried about whether substantial growth in revenue really will be stimulated by these lower prices. TIM Brazil (which is one of Intelsat’s biggest customers for cellular backhaul) is a good example, with their move to Epic Ku-band capacity giving them three times the capacity (partly from improved bps/Hz efficiency) compared to their previous C-band solution, with no increase in spending. And at least part of the fall in enterprise revenues seen by Intelsat and SES in the last two years appears to be due to less bandwidth being used by these customers, rather than simply price declines on existing (let alone incremental) capacity. Some of that reduction in capacity utilization may be due to more efficient modems, which could be a one-off effect, but I believe that the question of demand elasticity (in the face of competition from terrestrial alternatives) is going to be much more important challenge for the satellite market in 2017 and 2018 than a supposed “freefall” in bandwidth prices. If satellite operators can identify untapped opportunities where they can be competitive with terrestrial, as O3b has done in various Pacific islands, or where there is substantial demand elasticity as passengers create on commercial airplanes and cruise ships, then revenue growth will result. But if spend is relatively inelastic, as seems plausible for many enterprise VSAT (and perhaps some government) customers, then terrestrial competition may lead to continued market erosion. The biggest wild card is cellular backhaul: huge amounts of capacity are needed as mobile operators move from 2G to 3G to 4G in developing countries, so if these terrestrial players commit to satellite, there could be substantial revenue upside. On the other hand, if mobile operators focus on microwave as their backhaul solution of choice in Africa and Asia, it will be much more difficult to achieve significant growth in the satellite business. Back in March I noted that the Satellite 2016 industry conference “felt like 2000, as attendees peer over the edge of the precipice.” Yesterday, it seems the industry stepped off into the void, as Eutelsat’s profit warning proved to be the catalyst for a wholesale re-evaluation of the outlook for FSS/HTS data services. In reality, a look at some of the largest deals shows just how much of a price decline has already taken place. Traditional wide beam transponders have been priced at $3000-$4000 per MHz per month, which made Intelsat’s offer to IS-29 anchor tenants in 2012 of about $2000 per MHz per month look like a bargain (Intelsat said it leased 20% of the capacity, i.e. about 2GHz, for $50M p.a.). Although the split between Intelsat and SES is not given, its a fairly good bet that they will be paid roughly equal amounts in 2020 and beyond. This is consistent with Intelsat renewing and extending its existing contract with more capacity being delivered at about the same revenue level (Intelsat claimed last September it had an 73% share of the aeronautical satellite communications market and Gogo had $37M of lease obligations in 2016 before these deals were struck) and also consistent with the Intelsat deal running through Dec 31, 2023 (as stated in the 8-K) and the SES deal running for “ten years from the applicable commencement of service date” for the SES-14/15 satellites (implying 7-8 years of the respective terms remaining in Jan 2021). So if SES is leasing at least 2GHz of bandwidth to Gogo, which is the minimum amount consistent with the use of the word “several”, then the price of this capacity is no more than ~$1200 per MHz per month, and very plausibly the price may be as low as $1000 per MHz per month if Gogo is leasing say 2.5GHz. Given that the deal also represents a combination of wide beam and spot beam capacity, it certainly seems that SES’s HTS spot beam capacity is now being leased in (very!) large quantities for as little as $1000 per MHz per month, about 50% less than Intelsat’s original IS-29 deals. That makes it pretty clear why Eutelsat has decided to step away from the HTS Ku table and limit its HTS investment “to providing broadband access to consumers and small businesses”, presumably via its European and African Ka-band satellites (and its partnership with ViaSat). Back in March I also suggested we could be in for a re-run of 2001 with “a sharp fall in satellite orders” and Eutelsat has confirmed there will now be a “downward review of our capital expenditures”. So what comes next? Intelsat has just ordered a 9-series replacement satellite (a necessary step given that a large part of its C-band capacity reaches end of life in the next few years). But how much more Ku-band capacity is needed in the near term, given the looming threat of further price pressures from new Ka-band satellites like ViaSat-3? After all, despite large contracts with Gogo and Panasonic, there’s still a way to go just to fill up the HTS satellites that Intelsat and SES already have on order. And can Intelsat afford to match or beat SES’s price levels and still generate an adequate return on capital from the Epic satellites? Most importantly, how much repricing is still to take place for existing Ku-band data services, and what will C-band users do if their C-band capacity becomes significantly more expensive than Ku (let alone Ka)? In addition, though Inmarsat believes (correctly) that its a very different company from Eutelsat, it has far more exposure to the data services business, and Inmarsat will now have to reconsider its pricing (and capacity provisioning) for GX services, as this low cost Ku HTS capacity impacts the aeronautical and maritime markets. The Satellite 2016 conference this week has reminded me of years past. All the talk has been of ViaSat and their new ViaSat-3 1Tbps high throughput satellite (depicted above), just like in 2004 when Mark Dankberg used his Satellite Executive of the Year speech to describe his ambitions to build a 100Gbps satellite. Unlike back then (when most dismissed Dankberg’s plans as pie-in-the-sky), ViaSat’s announcement has already caused some large investment decisions by major operators to be postponed, and re-evaluated or perhaps even cancelled. Indeed the entire industry seems frozen like a deer in the headlights, trying to decide which way to run. Some competitors, like Inmarsat, have chosen to portray ViaSat-3 as a “mythical beast” and ViaSat’s current offering of free streaming video on JetBlue as a “marketing stunt”. However, its far more serious than that. One perceptive observer suggested to me that its like competing for the presidency against Donald Trump: how do you respond to a competitor who is clearly intelligent and has a plan to win, but deliberately says things that fundamentally contradict your (supposedly rational) world view. In the satellite industry the prevailing world view is that (at least in the foreseeable future) there is no need to build 1Tbps satellites offering capacity at $100/Mbps/mo, because satellite broadband will never compete directly with terrestrial and capture tens of millions of subscribers. But if ViaSat is determined to blow up the industry, most current business plans for two-way data applications (including essentially all Ku-band data services) are simply no longer viable. And if competitors remain frozen (or worse still dismissive) in response to ViaSat’s plans, then ViaSat will gain a head start on building these new higher capacity satellites. In addition to this overarching theme, several other nuggets of information emerged: Inmarsat is acquiring a seventh “GX payload” by taking over Telenor’s Thor-7 Ka-band payload in Europe on a long term lease, presumably at a very attractive rate (perhaps even approaching the Eutelsat-Facebook-Spacecom deal price of ~$1M/Gbps/year, given Telenor’s lack of Ka-band customers). And Globalstar now appears to have a roughly 60%-70% chance of getting FCC approval for TLPS in the next couple of months, given the FCC’s desire to set a precedent of protection for existing unlicensed services that can be used in the upcoming LTE-U rulemaking. However, it appears that any deal would require a compromise of 200mW power limits (the maximum level demonstrated to date) and sharing of Globalstar’s L-band spectrum above 1616MHz with Iridium. Going back to the title of this post, if last year’s conference felt like 1999, with exuberance about multiple new satellite projects, this year felt like 2000, as attendees peer over the edge of the precipice. Following on from that, next year could be like 2001, with pain to be shared all around the industry: a sharp fall in satellite orders, as operators re-evaluate the feasibility of their planned satellites, a continuing fall in prices, and the possibility of stranded capacity, either at operators, who are unable to sell their growing inventory of HTS capacity, or at distributors, who entered into contracts for capacity leases at prices far above current market rates. The exploding inflight connectivity market? Its been interesting to see Inmarsat’s stock price rising recently based on excitement about the prospects for its inflight connectivity business, as well as the fourth GX satellite (which Inmarsat hopes to lease to the Chinese government as the Financial Times also reported in October). We published our new Inmarsat profile in December which highlights the company’s prospects for strong revenue growth from GX over the next few years, although since then Inmarsat has faced a few setbacks, with the Intelsat appeal of Inmarsat’s US Navy contract win being sustained and Apax finally emerging as the purchaser of Airbus’s Vizada division, despite Inmarsat telling people before Christmas it expected to buy this business in early 2016. 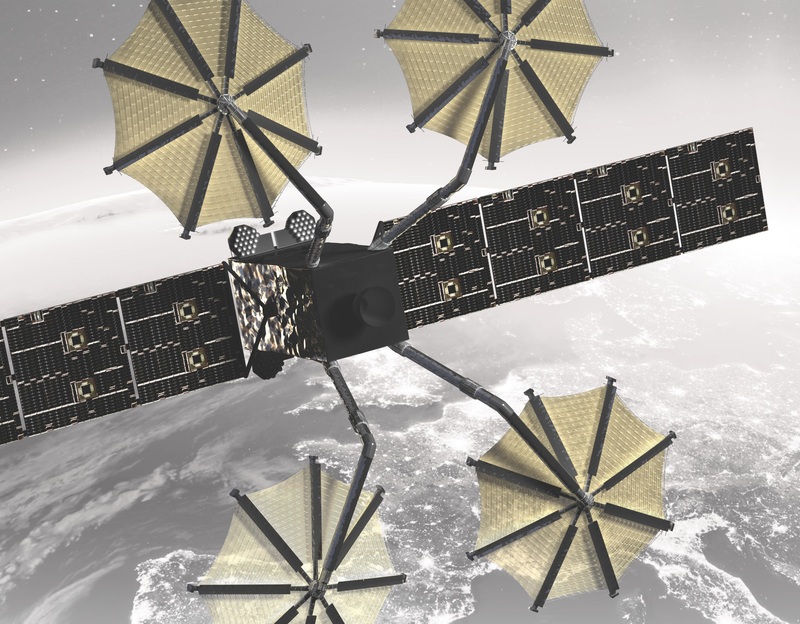 However, there is the potential for an even more worrying development in the near future, with ViaSat expected to give more details of its ViaSat-3 project in early February. This seems to represent something of an acceleration in ViaSat’s plans since last November, and it now looks possible that this announcement could include deals with some large new airline customers to provide advanced passenger connectivity services. If it can be realized, ViaSat’s proposed 1Tbps capacity for ViaSat-3 would have a dramatic impact on bandwidth expectations and more importantly the low cost of capacity would make it feasible to offer low cost or free Internet connectivity, including streaming video, to airline passengers, even as data consumption continues to grow rapidly in the future. ViaSat could potentially do deals with Southwest and/or American, the first of these sounding the long awaited death knell for GEE/Row44′s connectivity business and the second proving disastrous for Gogo, which currently gets about 40% of its passenger connectivity revenues from American Airlines (though any fleetwide migration to ViaSat wouldn’t happen until after the current 10 year contract expires in 2018, just as seems likely for Virgin America). Even amongst satellite operators there could be some upheaval, with Inmarsat having just ordered $600M of I6 satellites (actually $900M+ including launch, insurance and ground segment costs) carrying what looks, in comparison, like a puny ~30Gbps per satellite, SES having signed a ten year $290M bandwidth contract with GEE in November 2014, and Intelsat potentially set to lose some of its claimed “73% share of today’s aeronautical satellite communications market.” Most importantly, if passenger expectations of free or low cost inflight WiFi start to spread beyond North America, then Inmarsat’s estimate that its European Air-To-Ground network will generate $300K per plane per year (more than double Gogo’s current run rate) would look even more questionable. Widespread angst about the effects of new HTS satellites and slowing revenue growth is already weighing on the outlook for the satellite industry, but if ViaSat really does have one or more big deals to announce next month, then it would take concerns over future capacity and pricing trends to a whole new level. In that case we’d better all buckle in and get prepared for a very bumpy ride. Inmarsat has certainly had a great deal of success in the last two months, winning key contracts with the US Navy, Lufthansa and most recently Singapore Airlines, as well as a strategic partnership with Deutsche Telekom to built out its S-band European Aviation Network. While some of these wins may be a direct result of what Inmarsat refers to as “success-based capex” (otherwise known as giving away free terminals), these deals certainly have the potential to provide a significant boost to the company’s revenue growth outlook. Moreover, it seems that the biggest deal is yet to come, as Inmarsat hinted on its results call last week that “customers in different regions [are] vying to have the [fourth GX] satellite placed over their areas of interest” and the plan for this satellite is expected to be finalized before Inmarsat announces its Q4 results in early 2016. However, in practice there is one deal which is far and away the most likely outcome, and it appears these statements are simply a matter of Inmarsat trying to make sure that it still has some negotiating leverage. I’m told that the original intention of President Xi’s visit, accompanied by HRH The Duke of York and the UK Chief Secretary to the Treasury, was to have a signing ceremony for the agreement to formalize this “strategic partnership” and that would involve a full lease of the fourth GX satellite to China. Unfortunately the final agreement required certain changes and therefore could not be completed in time. However, assuming this deal can be completed, Inmarsat is likely to receive a further significant boost to its revenues. Given Chinese expectations are typically that they will receive lower prices than other countries, I’d expect the payments to Inmarsat for capacity could potentially be on the order of $100M p.a. (assuming the agreement is for 10+ years), depending on who covers the capex and opex costs for the new GX gateways in China. And China could then be in a position to provide free or subsidized satellite broadband capacity to adjacent countries in support of its geopolitical OBOR ambitions, just as Google and Facebook have been working to bring Internet access to developing countries. Once this deal is done, Inmarsat can move onto ordering I6 satellites with both L-band and Ka-band capacity, in order to supplement the (somewhat limited) capacity of the initial GX constellation. But with Eutelsat apparently looking for French government backing to buy a 3-4 satellite Ka-band system, and ViaSat (not coincidentally) announcing the intention to build its own even bigger 1Tbps satellites, the race to add lower cost Ka-band capacity is far from over. More importantly, despite all the attention given to Ku-band HTS in the last year or two, its hard to agree with the statement Gogo made on its Q3 results call (after its GX distribution deal with Inmarsat was terminated) that “there are simply not enough Ka satellites now or for the foreseeable future to meet the needs of global aviation”.